WOW Gospel 2004 kicks off the new year with a twist. You’ll get the same compilation of the hottest hits of 2003 and a handful of peeks into our year to come, but this year and for the next nine, WOW Gospel will honor one of the the top ten Gospel markets on its cover. This year (as with the Stellar Awards and the Super Bowl Gospel Celebration, WOW Gospel tips its hat to the city of Houston. Home to such Gospel greats as Yolanda Adams, Kim Burrell and new-resident Kurt Carr, Houston is holding its own and is poised to heighten its impact in the world of Gospel. Two compact discs jam packed with your favorites, this is always a must-have purchase for Gospel lovers. Even if you have many of the individual projects, its just nice and neat to have your favorites all in one place. Disc One plays out some traditional favorites such as Richard Smallwood’s “Praise Waiteth” and the Five Blind Boys’ “Wade in the Water” , as well as contemporary chart toppers, Kirk Franklin’s “Brighter Day” and Pastor Hezekiah Walker’s ubiquitous “I Need You To Survive”. Got Flash? Turn up your computer audio and check out the latest in our series of audio-digital animated Flash cards. 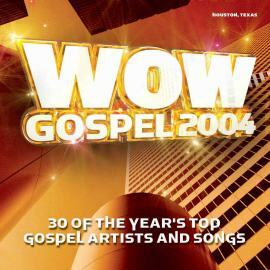 Click on the above image to experience the WOW Gospel 2004 CD. For the non-Flash version, click here. We get a preview of Tonex’s forthcoming Out The Box with “Doesn’t Really Matter”, a mid-tempo ditty about the sovereignty of God. From Smokie Norful’s Limited Edition, he renders the live version of “Still Say Thank You”. Marvin Sapp’s first time out on Verity yielded the hit “You Are God Alone”, while Darwin Hobbs simply and beautifully says just “You Are God”. Disc Two keeps it in the mix with traditional highlights from quarteters, Lee Williams & The Spiritual QC’s with “Right on Time” and Harvey Watkins, Jr.’s “It’s in My Heart”. Contemporary spins include Fred Hammond’s “You Are My Daily Bread” and Deitrick Haddon’s “Worship Medley”. Beverly Crawford’s signature vocals stretch on “Higher In The Lord”. New cuts include Joann Rosario’s “When I Enter Your Rest” from her upcoming sophomore step, and new Verity signees 7 Sons Of Soul with “He’s Coming Back”. In a longstanding tradition, a portion of the proceeds goes to benefit several charities. This year Save Africa’s Children, Compassion and World Vision are the chosen beneficiaries. So as WOW Gospel 2004 ministers to you, it will also minister to the needs of others. You can’t go wrong! Always featuring the hottest in the previous year’s line up, WOW Gospel never disappoints. The set is nicely bolstered by not only Verity's All-Star roster (which counts among them Vickie Winans, Donnie McClurkin, Fred Hammond, Hezekiah Walker, and John P. Kee, just to name a few), but also Word Record's Shirley Caesar and EMI Gospel's Darwin Hobbs and Donald Lawrence. So the partnering labels forge on with the best in Gospel music. All content in GospelFlava © copyright 1997 - 2004. No information to be reprinted or re-broadcast from this site without the expressed written consent of GospelFlava.com. All rights reserved.